by Michael Eggleston* (Advanced Biofuels USA) In order to meet the global temperature reduction target which was agreed upon at the Paris Climate Accord, delegates from the Biofuture Platform met in Bonn, Germany for the 23rd Conference of the Parties (COP23) on November 16th to discuss plans to scale up the low carbon bioeconomy. It was announced at the “high-level event” that the Platform’s strategy was finally adopted after nine months of negotiation in a major decision signaling large economic value to investors. It is the first time countries and other stakeholders have formally agreed to develop targets for biofuels and the bioeconomy. Key to this discussion is an understanding that the bioeconomy offers huge opportunities for job creation, sustainable development, technological innovation, agricultural intensification and energy security. With about 2.8 billion people today suffering from malnutrition, the Platform looks forward to improving the health and well-being of the developed world while leaving no one behind while they facilitate cooperative energy diplomacy needed to scale up this transition, said Special Representative of the UN Secretary General for Sustainable Energy for ALL (SE4ALL) Rachel Kyte. The United States did not take part in negotiations and China will be taking the responsibility to deepen exchanges with members of the Platform to discuss key issues in developing biofuels through problem oriented work methods and to mobilize the participation of various stakeholders in achieving tangible development. Leading the Platform by example, Brazil introduced RenovaBio; a market-driven policy incentivizing the production of biofuels by those who develop the most clean and efficient processes. Using life cycle assessments and an advanced financial end market system to take into account the positive market externalities of low carbon fuels, the efforts of the most efficient fuel producers will be rewarded fairly. Brazil’s hope is that RenovaBio will inspire other members of the Platform to reform their own national policies in a way that is sustainable for the long-term procurement of bioenergy. Although adopting RenovaBio alone may not be sufficient to reach Brazil’s national goals, the Minister of the Environment for Brazil, José Sarney Filho, supported the notion, as quote, in his absence in a speech he prepared, that other countries experiences will serve as valuable lessons to enhance the scale-up of bioenergy at the national level. Finland plans to aim for 30% share of renewable transport fuels by 2030 in order to facilitate building a carbon neutral country by 2045. Uruguay prepared a roadmap of innovation and knowledge for aviation biofuels to be included in their action carbon dioxide emission reduction plan for civil aviation activities. The document reinforces their commitment to implement the Paris Climate Accord. International Renewable Energy Agency (IRENA) announced results of a G20 context study with collaboration of International Energy Agency (IEA). It concluded that by 2050 bioenergy will provide nearly 40% of final renewable energy use. Achieving more ambitious targets sooner looks likely in a Nationally Determined Contribution (NDC) report which concludes that renewable energy capacity which came online in 2015-16 exceeds the amount expected by a factor of 2. In this context, IRENA is establishing a new facility to provide strategic planning and technical support to all countries seeking to do so. Results from a multi-national questionnaire developed by the Center for Strategic Studies and Management in Science (CGEE) and Brazil identify the countries capable of developing advanced biofuels and bioproducts. It also evaluates what policies and regulatory measures are currently in place. So far, 18 out of the 22 countries plus the European Union have completed responses to the questionnaire. Plans to release a draft outlining detailed national actions to support achieving the Platform’s goals and a reporting mechanism to track progress is scheduled for upcoming COP meeting next November. A bill to implement RenovaBio was passed by Brazil’s Lower House shortly after the event (now signed into law) and has received the formal support of over 54 civil society organizations and sectoral associations. Conclusions from IEA’s research stated that in order to limit the increase in global average temperature to well below pre-industrial levels, the share of biofuels in the transport sector must grow 3x within the next 10 years. Specifically, market share in advanced biofuels would need to scale-up more than 50x by 2030. Creating conditions for scaling up the low carbon bioeconomy is both an urgent and vital challenge because bioenergy, bio-based product deployment and investments are not growing quickly enough to reduce greenhouse gas (GHG) necessary to achieve the Paris Climate Accord’s global temperature reduction target. The technological development necessary to bridge this “gap” suffers from a number of barriers, including early stage scale-up challenges, financial risks, oil and feedstock price volatility and policy uncertainty. It will be up to individual countries and stakeholders to set the necessary scale and direction, as Sarney Filho explained. In order to explore the potential of possible actions and implement individual strategies at the national level, it will be important for governments at all levels, academia, industry and finance institutions to work together. Taking action is urgent, and some strides, such as Brazil’s RenovaBio, are already serving as examples to members of the Platform. 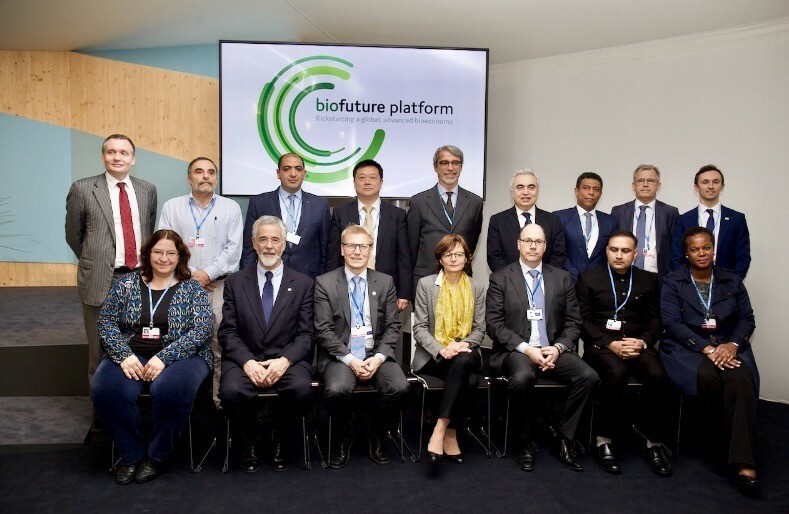 The full text of the COP23 declaration and more information about the Biofuture Platform – an initiative launched at COP22 in Marrakech – can be accessed here. Read More. The source for the IEA data modeling pointing out to the need to multiply biomass share of the global energy matrix under all 2º C and lower scenarios can be found in the IEA Biofuels and Transport Technology Roadmap.